One of the biggest decisions after you decide where to go to college is where to live once you are there! Some schools require freshmen to live on campus, so that makes it pretty easy! Others give you the option. Whatever the case may be for you, if you're living on campus then keep reading! I feel like a campus living expert seeing as I have lived on campus for 5 YEARS! 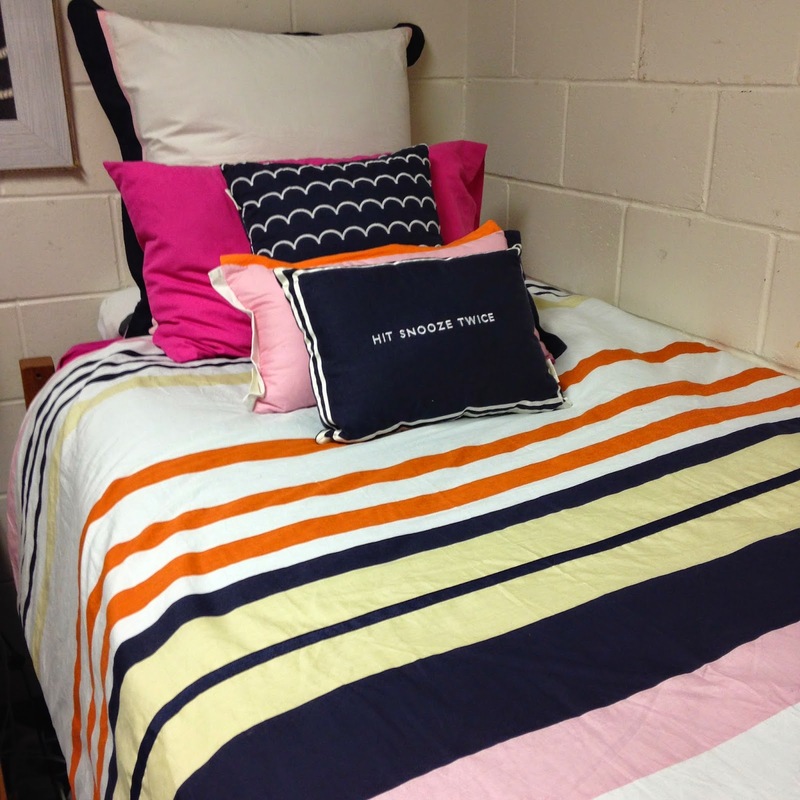 I have lived in 4 different types of dorm rooms so I will give you a little insight into each one. 2-room suite: my first summer in college I got to live in one of the newest dorms on campus, sadly that was the shortest semester of college :/ This 2-room suite had 4 girls living in it. There were 2 bedrooms and 1 bathroom. The interesting thing was that the sinks were in the bedrooms, so the bathroom was just a toilet and shower. Turns out that is a pretty smart design so that you can brush you teeth or wash your face even when someone else is using the restroom! 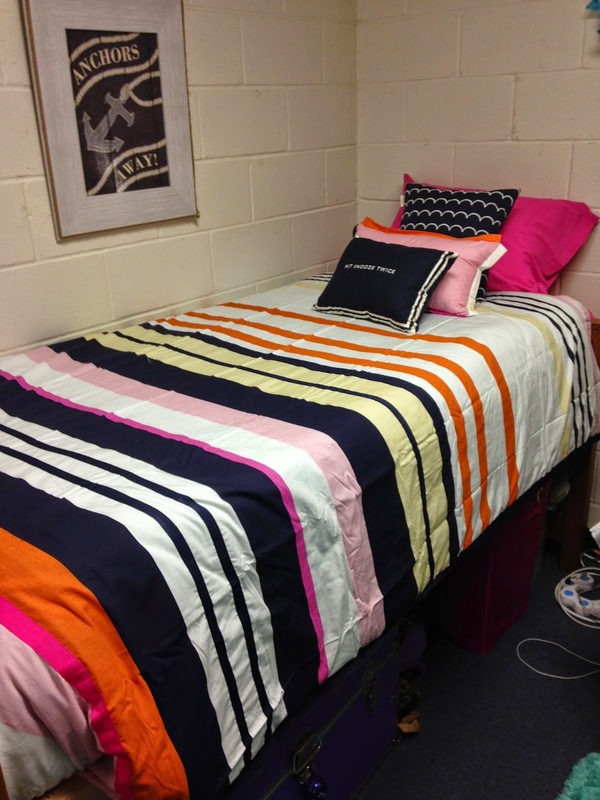 Classic double room: my freshman year was the classic college dorm experience. A room that I shared with a roommate (a friend from high school!) and the bathroom down the hall. Yep, about 30 girls shared a bathroom. dun dun DUN! Everyone's worst nightmare! It actually wasn't bad at all and we surprisingly never had to wait for the bathroom or showers, plus it got cleaned every single day! 2-room suite again: similar to the first one I mentioned but the sinks were in the bathroom this time. It still worked out because the toilet had its own door, although I don't think any of us girls went in when someone else was in there. Not pictured is the door/closet area which is where I am standing to take the picture. So now that you have an idea of the different types of rooms (there are more styles but these are just what I have experienced) let me give you a few tips. Tip 2. Bring touches of home. A rug, pretty lamp, and curtain can turn a cinderblock room into something actually cozy! Oh and lots and lots of pillows! Trust me your back will thank you when you end up studying in bed all day. If you are living where you will have a private bathroom then bring rugs and a shower curtain to make the bathroom home-y too. Tip 3. Bathroom necessities. This one is for those of you who will be going down the hall to shower and such. Get a shower caddy, it will hold everything you need! From your shampoo to your toothbrush. You'll also need a good bathrobe - hello walking down the hall - and shower shoes. You will need those for the hallway AND when you're in the shower! You don't know what other people are doing in there - ha! But really, wear your flip flops in there. Don't forget your towel! Tip 5. Multitask! Closets are SMALL. It is seriously sad but true. Bring clothes that can serve multiple purposes. Jeans, plain tees, tanks and dresses, versatile shoes. Then load up on smaller items like jewelry and other accessories to make your outfits unique. Oh man another long one! Hope you guys found this helpful, let me know if you have any questions! Click on the pictures above for tutorials! Click here for a super simple college packing list! Your decorative pillows are lovely! I was able to take classes on the weekends at the institute and late nights to accommodate my crazy schedule. There were a lot of college pranks that made life interesting and creative. It was just perfect.